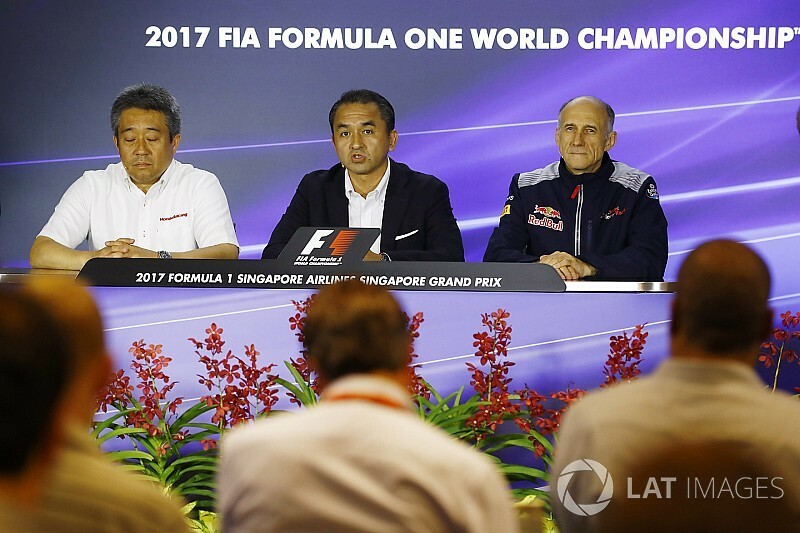 TEAM REPRESENTATIVES – Masashi YAMAMOTO (Honda), Katsuhide MORIYAMA (Honda), Franz TOST (Toro Rosso). Zak BROWN (McLaren), Cyril ABITEBOUL (Renault), Christian HORNER (Red Bull Racing). Moriyama-san, today the new partnership with Toro Rosso and also the separation with McLaren was announced. Can you make a comment from Honda’s point of view? Katsuhide MORIYAMA: Yes, good afternoon gentlemen, my name is Moriyama and I am the operations officer for Honda and today I am here representing Honda. Well, first of all, before we start, I would like to show my deep appreciation to the FIA and to Liberty Media for giving us such a huge support in order to conclude the deal in such a short period of time and in providing us such a special stage to announce our new start. So now regarding McLaren: it is very disappointing that we have to end the partnership without achieving our target, which we had set at the beginning of the project. Also it is a shame, the fact that we were not able to reach our performance target, that affected a lot the relationship. However, it also my pleasure that we can start a new relationship with Toro Rosso, a team with a very youthful energy and a history of nurturing the stars of the future. I think this is the start of a new chapter for Honda F1 and I’m already looking forward to seeing the opening race in Melbourne next year. Moriyama-san there have been suggestions in the past few months that the Honda board actually discussed pulling out of Formula One, and if so why did the board decide that Honda would remain in the sport? KM: For Honda, Formula One has started with the dream of our founder Mr Soichiro Honda and we already have a 50-year history in Formula One and for our company obviously Formula One is a very important culture as well as the DNA of our company. It is true that we have gone through a very tough situation now and nobody was satisfied with the current board, especially the board. It is true that we have gone through many discussions due to the dissatisfaction of the present and we discussed the project with the company and how to improve the situation. Quitting F1 was never an option for us. It is out goal to overcome this tough challenge and get back to fighting with the frontrunners of the sport. Our spirit, Honda’s spirit, is going to come back and for next year our goal is to fight for the top three at the front of the grid. Thank you very much. Yamamoto-san, you are the person who is actually dealing with all the negotiations with McLaren and with Franz and Toro Rosso. Tell us how it all happened from your point of view. Masashi YAMAMOTO: It’s true, because we have been struggling with the goals that we had, it’s true that from the beginning of the season there had been discussions with McLaren about dissolving our relationship. Honda always wished to continue with McLaren towards a good result. Therefore, it is, for us, a shame and a pity, a disappointment, that we have to separate. But as you know, since the Italian Grand Prix the results haven’t been famous and so our thoughts have started to change. So, as you know, in fact from the US Grand Prix last year, we work with Super Formula in Japan and from last year in the US we met with Dr Helmut [Marko] and we have been having conversations regarding the Red Bull [Junior] Pierre Gasly, who races in Super Formula in Japan. So I’ve had many opportunities to speak with Dr Marko since last year regarding the Super Formula and after the Italy Grand Prix, Dr Marko actually mentioned Toro Rosso. In fact, Mr Franz Tost has lived in Japan and knows Japan well, and as you know Toro Rosso is a very young team and I think we have many things in common and we are very much looking forward to working with Mr Tost. Yamamoto-san, Honda has obviously had a very difficult in coming back to Formula One, so what makes you confident that you have can success with Toro Rosso? MY: Although we do not have much time until the start of the next season, I feel that we are going to have a very good season, a good relationship between Honda and Toro Rosso. I believe that Toro Rosso is a pure racing team. The spirit of Toro Rosso is very similar to the spirit of Honda and in the short time we have I believe we can work smoothly and successfully for the next years. Franz why is this the right move for your team and who is going to make the gearbox? Franz TOST: First of all, thank you very much to the Honda management, to Moriyama-san and to Yamamoto-san to trust Toro Rosso. We at Toro Rosso are very proud and happy to work together with such an exclusive partner like Honda is and we are convinced that we will have a very successful future. The gearbox will be made by Toro Rosso, like the year before. OK, what happens this year and next year with drivers? Dany Kvyat, Pierre Gasly we’ve heard about and also Nobuharu Matsushita. What are your thoughts on the drivers in this situation? FT: Well currently we have two quite successful and competitive drivers with Daniil Kvyat and Carlos Sainz and I assume that they will finish the season with us and regarding the drivers for next year and then Red Bull will decide who is driving with us and of course we will also take into consideration any request from our partners. Q: (Joe Saward – Auto week) A question for Yamamoto-san. What have you learned from your experiences in F1 during the past few years? MY: Well, I have joined this project last April and I have realised that Formula One is indeed, as it’s said, a top-level championship – quite different from the domestic championships that we have. To keep a good relationship and to keep everyone satisfied is very difficult. As a manufacturer I realise that Formula One’s technology is very high and for Honda, that joined a year later, it has been a struggle for us to keep up with the new technology. Q: (Dieter Rencken – Racing Lines) Yamamoto-san it’s not secret that Honda haven’t managed to make a success of Formula One for the past three years, so why should it be more successful for the next three years? For Mr Tost, why do you believe that Honda can actually make a success of Formula One until the end of 2020? MY: It's not that I’m more confident for the next three years but it is that when we compare our policies, Mr Tost’s and Honda’s, Toro Rosso policy and our policies are very similar and so we think we can work in harmony and move forwards for the next three years until the change of the regulations. FT: Four years ago, it was in October, before the Suzuka Grand Prix, I visited the Honda factory. They have a fantastic infrastructure and I think in the meantime I think they have learned a lot about the new power unit and I am convinced within the next three years, also within the short term, Honda will improve their performance dramatically. They have already come up with real good upgrades during this season – unfortunately, because McLaren is very close to us – and I am 100% convinced that Honda will make big steps forward in the near future and within the next three years and therefore, once more, as I said before, we are more than happy to work together with such a fantastic partner. I am looking forward to next year because I think that Honda and Toro Rosso will have a successful season. Q: (Luis Vasconcelos – Formula Press) For Franz: Getting a works engine was always one of your targets for Toro Rosso. Now that’s done, do you think that your team has what it takes to fight with the other works teams like Ferrari, Mercedes and Renault? FT: Toro Rosso is not Ferrari, Mercedes; we have another infrastructure. But I can promise you that we, within our possibilities, will do the best possible job and then the rest we will see. It is not always and only the money which is decisive for the success. I hope at Toro Rosso we will work efficiently, because this is our slogan, and to get the most out of the package and then the rest then we will see. The future will show. If necessary, then of course, maybe we will bring in more people, increase even the infrastructure, whatever is necessary to have the success that Honda wishes, but this is too early a stage to talk about the details of the infrastructure. But I am convinced we are in a position to fight successfully within the midfield or the forward part of the midfield and the rest then we will see. Then future will see. Q: (Sandor Meszaros - Autosport ES) A question for Franz. Congratulations on the Honda deal, but I wanted to ask you about Sean Gelael, who drove today in one of your cars. We saw him, he performed in a very mature way in the Monza F2 races and he was very calm today. How do you see his performance and how do you see his future? FT: Sean Gelael was testing with us two times. The first time was in Bahrain after the grand prix. He showed really a very, very good performance there. We were surprised, because I didn’t expect that he would be so fast after I saw his Formula 2 race the day before. The second time he tested in Hungary. There he showed a real good performance, especially in sector one. In Sector two he was matching the times of our drivers. And now today he was out in Free Practice 1. He will do another Free Practice 1 and then we have another test in Abu Dhabi and at the end of the test in Abu Dhabi we will sit together and we will discuss further steps for the future. He will do next year Formula 2 as it looks like and then we will see. It depends always on the driver. If he is doing a fantastic job and improving his performance then of course there are always doors open. But first of all he has to perform really well next year in Formula 2 and then we will see. Today he did a fantastic job, we were really happy with him. Q: (Dieter Rencken – Racing Lines) Yamamoto-san, I believe that McLaren Applied Technologies, a sister company to the Formula One team, supplied a lot of the hybrid componentry. Will that continued going forward despite the split? MY: For the time being we will continue with that company. Meanwhile, we are already producing most the parts by ourselves, so in the future it will be all produced by Honda. Q: (Joe Saward – Auto week) Moriyama-san. The President of the Honda company says that you need to take more risks to get back to how Honda used to be. Do you think that is one of the problems you have had in Formula One? KM: No, we don’t think so. We don’t think that the problem was not taking enough risk. As Mr Yamamoto said earlier, we had a gap when we returned to the Formula One and closing the gap has been the biggest problem. And so to shorten the gap, Honda has done the best we could. We reached everything, we sped up as much as we could to reach a compatible level. Therefore, I believe we have been able to catch up and shorten the gap quite a lot but we understand there is more to be done. Q: (Chris Medland – Racer) A question for Franz. You mentioned the driver line-up for the rest of this season, saying you hope to keep Dany and Carlos until the end of the year but does there remain a possibility that your could lose Carlos from the next race onwards and how keen are you to avoid that sort of disruption? FT: I’m not aware about this. Q: (Chris Medland – Racer) So there is no possibility? Q: (Abhishek Takle – Mid-Day) A question to Yamamoto-san. It’s well known that Honda contributed a significant amount to McLaren’s budget. Will that amount now go into Toro Rosso’s budget? How do the financials work out under this new agreement you have with Toro Rosso? MY: Well, you probably read a lot of news on the internet. As I want to express here: our relationship with Mr Tost, with Toro Rosso is very amicable and is very leveled. Therefore we are not planning or thinking of having to pay a big budget to keep a position or anything like that. Q: (Graham Harris – Motorsport Monday) Yamamoto-san, there were rumours before this deal was announced that Honda was considering purchasing Toro Rosso. Was this ever considered as a possibility and if not, would it be something you would consider in the future? KM: Well, me too, I read it in the news. We never discussed that in our company and we haven’t discussed future possibilities either. Anyway, our relationship with Toro Rosso is very good and our ideals and our goals is to get both our strong points, match them together and bring that into a great performance, so it is 50-50. Q: (Joe Saward – Autoweek) Yamamoto-san, are you going to supply Red Bull with engines in 2019? KM: Well, our main goal now is to absolutely concentrate on 2018 and Toro Rosso, We are going to give our best to achieve our best performance together as a team. But if there is a chance in the future to supply engines, why not. But at the moment track performance is our main goal and that’s what we are focused on. Q: (Dieter Rencken – Racing Lines) Yamamoto-san, Moriyama-san, I don't who can answer this question best, but in the past to Honda Formula One was always a technical exercise but one gets the feeling that since the 2000s or thereabouts it’s actually become a marketing or communications exercise. What is Formula One actually to Honda – is it marketing or engineering, and if it is both, what is the split? KM: Well, as I earlier mentioned and as Mr Moriyama mentioned, Honda’s DNA is motor sport and in anything we do work under the racing spirit and therefore it plays a very strong performance in our production, in our challenge, so our workers they have in mind this racing spirit, motor sports as DNA whenever they produce anything. Therefore, we don’t divide it into percentages of marketing or technology. It’s the mentality, the philosophy of motor sport, DNA, racing spirit into creating anything we do. Q: Zak, let’s start with you. After much deliberation, you’ve separated from Honda. What was the tipping point, and what sacrifices do you have to make now? Zak BROWN: Well, let me start James, and then I’ll come back and answer that question. I want to thank a lot of people because this has been quite a public process and involved a lot of people and required a lot of cooperation to get the outcome that I think was best for the sport. So, starting with the McLaren fans, they’ve been unbelievably supportive as we’ve been through a difficult three years and looking forward to next year. We’re very excited to be partnering with Renault and all the work that Cyril and his team have put in and then it took the collaboration of Christian, to my right, Toro Rosso and Red Bull, and then last but not least Honda’s been a great partner. Obviously, we haven’t had the on-track results that we’d hoped for but they certainly gave it everything they’ve got. We felt it was time to move on, and then the FIA and Ross and Chase. So, there was a lot of people that had to come together to make this happen. Ultimately we knew… I don’t think there was a specific tipping point other than we knew we were in trouble in pre-season testing and we needed to improve upon our 2016 results. So, we knew we were in trouble then. We’ve spent quite a bit of time, most of it has been in the public domain, trying to find ways to get Honda competitive with us, and we ultimately couldn’t get there in the end – but great that they’re staying in the sport. Just want to thank everyone for their assistance. I think everyone’s going to be excited for Australia next year. Q: So, does this mean Fernando Alonso will be staying with the team next year? ZB: Well, we’re going to turn our attention to Fernando now. We’ve been speaking a lot, he’s been waiting to see what technical solution we came up with. He won his two championships with Renault. He’s very happy with the racing team, we’re very happy with him, so I think in the not too distant future we should be able to get something done and that’ll be the last big piece of the puzzle. Then I’ve got to find us some sponsorship with our commercial team and get ready for next year. Q: Cyril, coming to you, we’ve heard from Honda and Toro Rosso in part one of this press conference, their side of the story, we’ve now just heard from McLaren. Tell us about the Renault side. The engine swap and Carlos Sainz coming to you. Cyril ABITEBOUL: Well, as mentioned by Zak, it’s been a fairly long and complex process for the number of parties that this was involving but I think that the solution reached is one that is good for all parties. It’s in particular one that manages to keep Honda in the sport, and I think it’s very important to keep diversity of manufacturers involved. As far as we’re concerned, it was not an easy decision. We know that we are making a competitor stronger. We know that very well. Having said that, the activity of Renault in Formula One, since 40 years that we are in Formula One is in particular articulated around what we are doing on the engine side: we are a car maker; the engine is at the core of the automotive. That’s what we have always been doing. We have been a works team on and off, we are currently ‘on’ – but it doesn’t remove anything to our engine activity that must be sustainable. In relation to that, what we want to do is to supply aspiration teams, great teams, great drivers. We’ve done 13 years with Williams with five championships, 12 years with Red Bull Racing, four championships as constructors, so we really look forward to the start of this new association with McLaren. Q: Can you confirm exactly which teams you’ll be supplying with engines from 2019 onwards? ZB: You said we were going to get better stuff! CA: Oh yeah! Sorry! This is a public one! So, this is something that matters. And in relation to 2019, obviously with McLaren today we are announcing a three-year partnership until 2020 and the rest, obviously, is a bit of speculation at this point in time with Red Bull Racing. Q: OK, Christian, coming to you, what is Red Bull’s plan for engines form 2019 onwards? I understand that you alluded to this on TV earlier today. Christian HORNER: No, I think what you are referring to, I was asked a question about Porsche coming in Formula One and I answered that very clearly that we have an existing relationship with an OEM that don’t make Formula One engines and obviously, that will continue. We are absolutely delighted for Toro Rosso with their Honda announcement. I think it’s great news for Toro Rosso, it’s great news for Honda, it’s great that they’re continuing with Formula One. Obviously, it’s facilitated that Zak has managed to get the Renault engine that he was craving and Carlos Sainz gets to further his career obviously in Cyril’s team while also remaining part of the Red Bull family. So, I think you have a rare occasion in Formula One where everybody’s happy. Q: Does any of this make your job more difficult in securing the long-term commitment to Red Bull Racing of Max Verstappen and Daniel Ricciardo? CH: Well, both of our drivers are currently under contract at least for next year and it’s down to us to produce a good car, be competitive and then, of course, why would the drivers want to be anywhere else? We’re obviously not short of options on drivers but obviously, our preference is absolutely to retain the two that we have in the car at the moment. Q: And just a final quick through from you, very strong performance today, particularly in FP2. Daniel was in here yesterday and he said he thought he might have a chance of winning this race. Does everything you’ve seen today – short runs, long runs – give you a bit of encouragement on that front. CH: I think both guys have had a strong day today, particularly Daniel this evening had a strong session – but we didn’t really see Ferrari’s true hand, particularly on the short runs, and Mercedes always hold a bit up their sleeves – but it’s been certainly a positive day. I think Daniel’s invigorated by his new haircut that he turned up with the other day and obviously been using that air conditioning to good effect. Q: (Andrew Benson – BBC Sport) Cyril, you described 2019 as ‘speculation’ just then but have you told Red Bull already that you don’t want to supply them in 2019 – and if you have, how do you intend to… are you confident you’ll be able to stick with that given the undertakings you have to Formula One Management? CA: Well, obviously Red Bull is well aware of the situation and right now we really want to focus on what’s certain – and what is certain is 2018. Any other year or situation will be looked at vis-à-vis different undertakings that we have with FIA. All manufacturers have got some obligation to supply, so the situation is fairly straight forward. I think that it’s more on the Red Bull camp to define what’s best for them medium- to long-term. Q: (Chris Medland – Racer) Zak, if I could just ask you, in the Renault press releases they talk about their mid-term goals and challenging for championships in 2020. This is a three year deal – do you see this as a short-term fix for McLaren – and is there any fear of Red Bull picking up a Honda power unit that has turned things around in the future? ZB: No, this is not a short-term fix. At the end of the day no-one knows yet what the engine rules are in 2021, so I think it’s hard for anybody to look beyond 2020 because we don’t know what ’21 looks like. We think we’ve got a long-term partnership, the foundation for it. Renault’s got a great history in the sport, won a lot of championships with Red Bull, won a lot of championships themselves, so we’re very happy where we are: we think we’ll be very competitive together. Any fear or Red Bull-Honda? ZB: We’ve got great competition on both sides of me right now and Ferrari and Mercedes. I think probably what we’re most concerned about is not a Red Bull-Honda combination or any combination out there. We need to get budgets under control. I think the reason you see the gaps in the field now is the gaps in budgets between the top two teams and everyone else is way too big. The gaps seem to be getting bigger I think that’s something that Formula One is going to address. That’s probably where our biggest concern is: making sure we get a more level playing field. So, many teams can win races, ’21 onwards. Q: (Dan Knutson – Auto Action / Speed Sport) Cyril, Red Bull and McLaren build very good chassis. You’ll all have equal engines next year – what are you going to do to match them? CA: Build a very good chassis! How? Well, frankly, if we are in Formula One it is not just to make up figures. It’s not just to participate. We are here with ambition at some point in order to challenge top team. Those two teams are top teams but there are two others in Mercedes and Ferrari. So, the problem is not just McLaren, it’s all teams that we must be able to fight against by 2020. In relation to that we are recruiting, we are investing, we are hiring obviously young drivers, we are finding new sponsors, we improve the commercial side of the business. We now have a sustainable association with McLaren, so all of these elements are playing a role in that target to be at the top by 2020. Q: (Dieter Rencken – Racing Lines) Zak, you spoke about the inequitable budgets and pay outs and whatever else in Formula One. Your team and Christian’s team are two of the four teams that actually receive preferential payments and bonuses from Formula One management. You say you need to get budgets under control – that would tend to indicate that you’re talking about a budget cap of some type or other, as well as an equitable payment structure. All three of you, do you believe that budget caps should be introduced – and how do you feel about the figure of $150million that’s been discussed at the moment – excluding drivers, management and engines? ZB: Speaking for McLaren, we’re a fan of budget caps. We think it’s important. Most other sports have it and it will equal the playing field. And we recognise that means, as you mentioned, we’re one of the four teams that get special payments, that might mean some compromise – but we feel if the sport is healthier ultimately that will benefit all of us. We’re a great racing team. There’s lots of great racing teams and we want to race and have the same chance as everyone else. The $150million number that we here, that sounds in the right ballpark. You get into a lot of detail: how do you handle CapEx, executive salaries, overhead etcetera, etcetera, so it’s quite complex – but the concept of the budget cap, yes, and the number of $150million seems to be in the right ballpark. Q: Christian, do you and Red Bull’s owner Mr Mateschitz see things in the same way? CH: I think we see things slightly differently. We’re fully in favour of reducing costs. I think the problem if you just introduce a budget cap with current regulations is that we’ll end up employing teams of accountants to find smart ways of circumventing the current set of rules. So, I think the biggest cost driver are the technical regulations – and I think FIA, FOM need to get those under control: to get the chassis-side under control, to clean up the cars – they’re starting to look far too messy in terms of all the appendages that are growing on them. And, of course, a key part of that also is the engine. We’re sitting here today with enormous engine bills because of the technology that are involved in these power units. The manufacturer obviously is bearing the brunt of the research and development costs of those engines that one has to question, what is the actual road relevance of? So I think there needs to be an absolute root and branch review of the regulations. I think once that is done, then you can potentially look at a budget cap – because it becomes a far softer mechanism than if you introduce the budget cap tomorrow, then with race teams incorporated as part of larger OEMs it would be almost impossible to effectively police the allocation of resource and spend and facilities, etcetera. CA: Pretty much the view of both McLaren and Red Bull. I would tend to agree that if there is any form of cap or cost control mechanism through the regulation it should also encompass the engine – but not just the cost of supply but also the cost to develop the engine. That’s something we fell short so far. It’s complex – but I understand something that Ross Brawn and Liberty are taking very, very seriously and will come up with some proposal in the near future. Q: (Graham Harris – Motorsport Monday) Cyril and possibly a comment from Christian, as part of the package deal that’s been done amongst the teams, you’ve now got Carlos Sainz for 2018. There’s been much speculation that he could be in a Renault seat before the end of this year. Is that something that is potential to happen and if so, Christian, would you be behind it? CA: Yeah, you know I want to talk about realities. The reality is that Carlos will be in the car in Melbourne in 2018. Obviously your question makes reference to the situation of Jo, Jolyon Palmer. It’s a speculation that we – him and the team – have had to live with for… I don’t know how many races and frankly it’s really difficult on Jo and a bit unfair on Jo and the team and to a certain degree, it maybe has had a negative impact on his ongoing performance. Right now, what I see is that we have a car that is capable of scoring points in Singapore. That’s the focus and we have an ongoing contract with Jo until the end of the season. CH: We’ve lent Carlos out to Renault from 2018. We’ve retained him within the Red Bull family because obviously we rate him as a driver very highly. We will be very interested to see how he performs against Nico Hulkenberg. I think any speculation prior to that is very much Renault’s business. Q: (Abhishek Takle – Mid-Day) Zak, Honda brought a significant amount of investment to McLaren which won’t be there now. You spoke about going out and having to raise sponsorship; how do you plan to plug that shortfall and how confident are you that that shortfall can be plugged relatively quickly? ZB: Well, I’m very confident. We have control of our finances. We’re a big team, we’re fortunate in that we have very committed shareholders, that the remit is ‘go win races, make the right sporting decisions and then the business will follow.’ It’s certainly going to be a lot easier to find sponsorship partners running towards the front of the field. It’s something that we’ve invested a lot in, the commercial team. It’s a big area of my background, I’m certainly not responsible for the speed of the racecar. And so I’m confident. It will take some time but our shareholders are very committed, very aware and we wouldn’t have made this decision if we weren’t prepared to work through short term economic loss from the lack of Honda income. Q: (Jerome Bourret - L’Equipe) Mr Abiteboul, could you please sum up the strengths of the two drivers you will have in your team next year, and could you please also precise the expectations you will have in terms of results? CA: In terms of expectations, maybe it’s a bit too early to talk about expectation for 2018, apart from the fact that it has to be a year that we will continue the construction of the team and the progress toward… from the midfield to the top team. This season is not completely dead. We already have a big job ahead to try and finish better than where we are currently and where I think… the car is capable of doing much better than eighth in the championship where we are today. As far as the drivers are concerned, I think we will have a perfect combination and balance between experience with Nico – lots of seasons – but also something to prove. He’s still yet to score a podium and we hope to be able to provide him with a car that’s capable of that, starting next year. And Carlos, still young, but already lots of experience in a good team, good organisation, good academy, three years with Toro Rosso. We can also remember the years that he was against Max Verstappen and actually the gap was not huge. I think everyone sort of wondered… the decision of Red Bull which obviously I’m not challenging… of going for Max rather than Carlos, which says something about Carlos’s pace and abilities and also the fact that Red Bull wanted to retain him as a driver and only be prepared to let him go as a loan does say something about the pace of Carlos. And he’s also not well (un)known to the family. He was racing with Renault in junior categories. He won Formula Renault 3.5 and Formula Renault 2.0 so it’s also to a certain degree some form of a return on somethings that we have invested in because sometimes people question why Renault is investing so much in these younger categories and this example is a good example as to why we are doing that. Q: (David Croft – Sky Sports F1) Cyril, Christian, I’m confused. The story is out there, you’ve not denied it but you’re not confirming it either, so on behalf of everyone who wants a straight answer to a straight question: are Renault supplying engines to Red Bull in 2019 or not? CH: Well, look David, anything that is beyond ’18 is speculation, so it’s neither confirming nor denying. So the situation for ’18 is absolutely clear. Anything beyond that will be dealt with behind closed doors, not through the media in terms of what will be the future, so I think the situation post ’18 is very clear. Our focus at the moment is on designing the best car we can for ’18. We will have a TAG Heuer Renault-provided engine and that will be the case for next year. Anything beyond that is speculation, conjecture, and there will be all kinds of rumours, I’m sure, between now and then. Q: (David Croft – Sky Sports F1) Do you want to supply engines? CA: Do we want to supply an engine? We are an engine supplier. Frankly I think Christian has provided the best possible answer. I think that you must appreciate that there are a number of things that need to be considered and discussed. I think, frankly, you can infer from the answer of Christian what is the contractual situation which we have no obligation to disclose at this point in time. We’ve got a number of obligations towards the FIA. There was a reference to the obligations towards FOM; as an engine manufacturer our business Is obviously to supply engines, not under any terms, not under any sort of circumstances and it has to serve a strategic interest which I guess is what will be discussed in the future. Q: (Chris Medland – Racer) Christian, when McLaren-Honda partnered, I think it was Ron who said that the only way to win championships was to have a works partnership. Do you think that’s going to be the case, going through to the end of 2020 and how difficult is it going to be to change beyond the end of 2020? CH: As I said earlier, I think everybody’s genuinely happy and excited about Honda remaining in Formula One. I think it’s great news for Toro Rosso, I think it’s great news for Honda and we’ll certainly be paying very close interest to that. I think that the engine is too much of a performance differentiator in Formula One as it currently stands and it’s wrong that manufacturers and teams find themselves in this situation. I just hope that moving forward… Ross seems to have a really good group of people around him. He seems to be working very well with the FIA to come up with a sensible set of regulations that control costs, of development that controls effectively the spread of performance, controls the supply price to customers and creates a more level playing field than we’ve seen since the introduction of these regulations that have been - really since they’ve been introduced in 2014 - have been extremely divisive and haven’t really added to Formula One that I can see in any way. Q: (Dieter Rencken – Racing Lines) With reference to the answers that I got earlier on regarding the budget cap and also what you’ve just said, Christian would you be prepared to accept a cost cap or budget cap linked to regulations from 2021 onward when the current regulations expire, so that the two get introduced simultaneously? And then to Cyril, Cyril, does it make sense ramping up your team, knowing that budget caps could actually be in place by then? CH: Answering the first part of your question: we’re all in favour of reducing costs. Now the reason that we were previously against budget cap was because, as a team that was just a Formula One team, we were concerned, compared to our rivals that were part of OEMs, that costs could be hidden, could be contained. I think if you deal with the root source of the problem which is the regulations that create the expenditure, then bringing in a cap on top of that, if the two are done hand-in-hand, that’s acceptable to us but they have to go hand-in-hand. If you put all the pressure just on a budget cap, as I say, we’ll end up in a World Championship of accountants and who can hide the most money. CA: No, it’s a good question. Anything we are doing, right now, obviously is with the current set of regulations, so it’s very difficult to assume a different set of regulations when you make strategic decisions like investment, like recruitment. Having said that, we really put at the top of our priorities the cost efficiency of the organisation. We accept that the cost efficiency actually… if you want to be a very competitive team in Formula One, you need to accept right now to be very low in terms of cost efficiency. And that’s something we try to see from a different angle. Right now, our commercial structure is slightly different from the top teams. There was reference made previously to the CCB status and others coming from FOM; we do not enjoy that status, so actually, to a certain degree, a cost cap would not hurt us to the same degree as the other teams and we believe that it’s good for the sport. So we are still at that position where we can adjust what is our lending platform in terms of recruitment, so we don’t feel that there is any risk related to that. Q: (Michael Lamonato – Class Act Media) Question to all three and to Cyril in your capacity as an engine manufacturer rather than a works team: there’s been a lot of talk about grid penalties all year and particularly after the Italian Grand Prix Ross Brawn said he would perhaps like to see a future without grid penalties. Have you had those discussions with Ross about what those alternatives might be and amongst the three of you, do you have any solutions you believe would be fairer than what we currently have? CA: There is a solution which is to have an engine that is reliable or a car that is reliable and that’s our priority, frankly, and we come short of that objective right now. Clearly it’s going in the right direction in the sense that there will be even fewer components alone next season. Having said that, most of the penalties that we have this year are related to the fact that we were very late in the development of our engine this year and we have all the confidence to be much more reliable next year, despite the fact that the life of the engine will be increased. Having said that, I think that grid penalties do not make sense. When you already have a problem on track, there is already a pain. To a certain degree it’s a double hit, a double impact which I think we could easily lose but we will still need, given the cost of the engine, to have some form of limitation in the number of engines that are used. Right now, we are making plans for the regulation and we need to have some form of stability we’ve invested in order to make the move from four power units (to three) per driver per season, I would hate having to go back and having this situation to be changed for next year. Having said that, I guess the penalty could be changed. ZB: Well, I consider us to be grid penalty experts and we need to get rid of them. I think it’s confusing for the fans, 65 grid penalties here, we start here, we start there. There’s got to be a better way. Haven’t yet really thought through what the best solution is but I think when fans show up to races they want to see the best drivers set the fastest times sitting at the front, where they belong. So certainly, there needs to be some sort of penalty but I think it’s gotten to the point now where it’s not easy for people to understand what those penalties are so there’s got to be a clearer way to do that. CH: As Zak said, I think most importantly for the fans… I mean who on earth could understand what was going on on the grid at Monza? I mean that was just nuts. I think the penalties are inelegant. Why should the driver be penalised? Maybe it should be a team thing as opposed to the driver or maybe the manufacturers should just be fined a disgustingly large amount of money for every failure that there is so that could be another way of… Dieter’s point of wealth distribution.